Atelier 29 is a personal interest blog with a focus on unique and innovative design. Scroll through the website, or focus on one of many categories, including: advertising, architecture, art, eco & environmentally friendly, illustration, furniture, interior design, and product design. 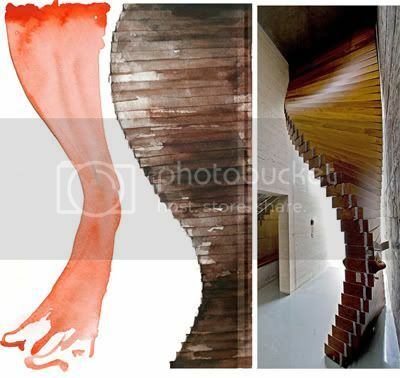 The above image is a design transition from concept to reality by Matharoo Associates. The group designed a door for a diamond merchant's residence in Surat, India. The door is 5.2m high and 1.7m wide and consists of 40 sections of thick 254mm Burma teak. Each section is carved to integrate 160 pulleys, 80 ball bearings, a wire-rope and a counter weight hidden within the single pivot. In the market for a new pair of archi-spectacles? Well, they may not be black, but these will certainly set you apart from the crowd of black turtlenecks and thick-rimmed glasses... in a respectable way. The 'Ming' bamboo glasses are a collaboration between Chinese designer Chen Chun-hao and bamboo artist Huang To-en. 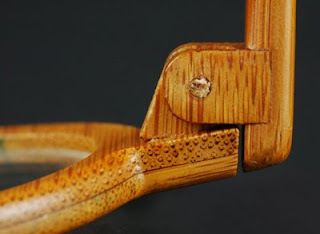 The glasses are made entirely of bamboo, with a patented hinge design developed by Huang To-en.